5/18/10 Virtual Games – Spring and Fall 2011 Sponsors: 2010-2011 WRAP UP. 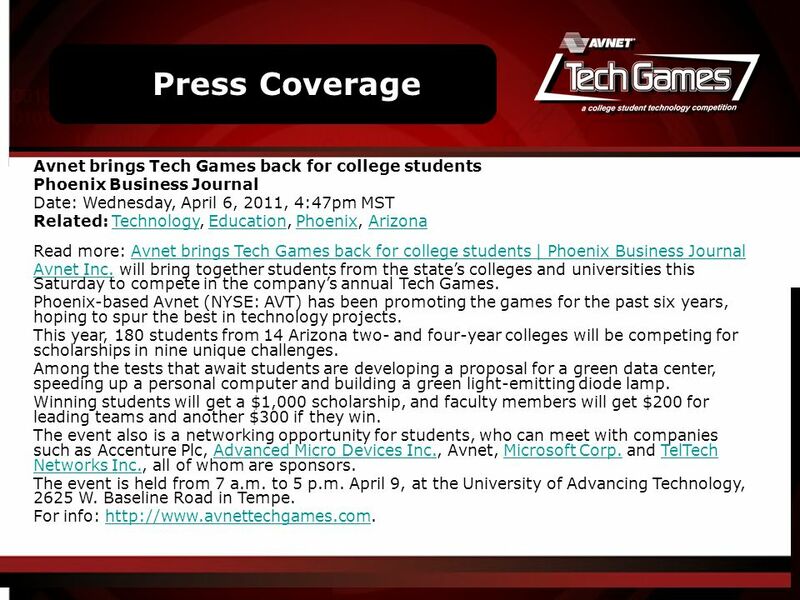 2 5/18/10 Virtual Games – Spring and Fall Overview l PHOENIX -- Nearly 190 students from Arizona community colleges and universities competed head-to-head for top honors in Avnet, Inc.'s (NYSE:AVT) sixth annual Avnet Tech Games onsite competition presented by Microsoft on Saturday, April 9, 2011, at the University of Advancing Technology in Tempe, Ariz. Twenty-seven winning students collected $1,000 scholarships. These prizes were made possible in part by a $50,000 donation from the Carstens Family Funds for a third consecutive year.Avnet, Inc.'sAvnet Tech Games A panel of judges of technology firm executives, engineers and technical experts selected the winners based on their ability to meet the technical requirements of the task, apply innovative approaches to the solution and demonstrate professional skills. 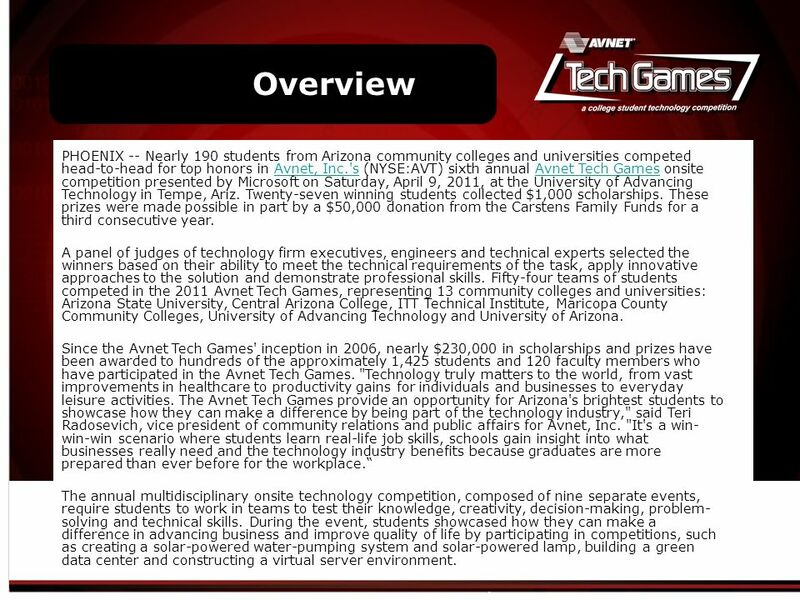 Fifty-four teams of students competed in the 2011 Avnet Tech Games, representing 13 community colleges and universities: Arizona State University, Central Arizona College, ITT Technical Institute, Maricopa County Community Colleges, University of Advancing Technology and University of Arizona. 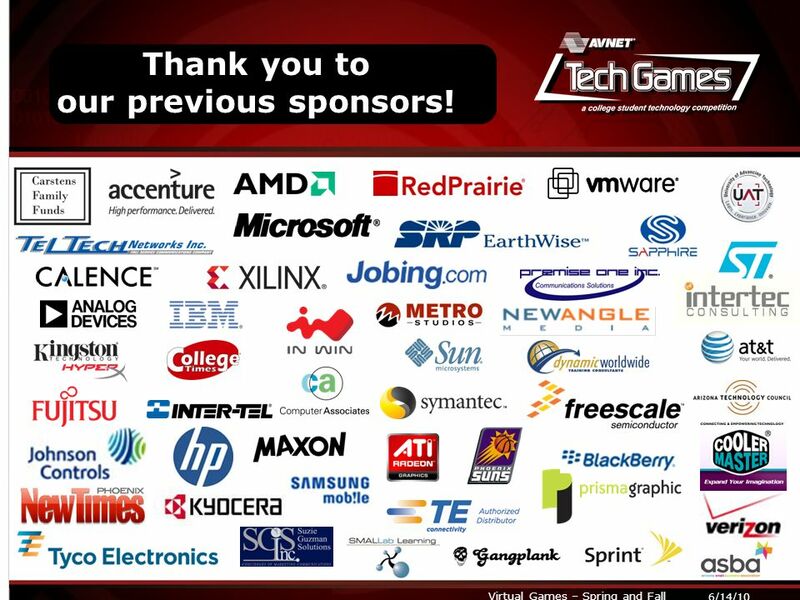 Since the Avnet Tech Games' inception in 2006, nearly $230,000 in scholarships and prizes have been awarded to hundreds of the approximately 1,425 students and 120 faculty members who have participated in the Avnet Tech Games. "Technology truly matters to the world, from vast improvements in healthcare to productivity gains for individuals and businesses to everyday leisure activities. 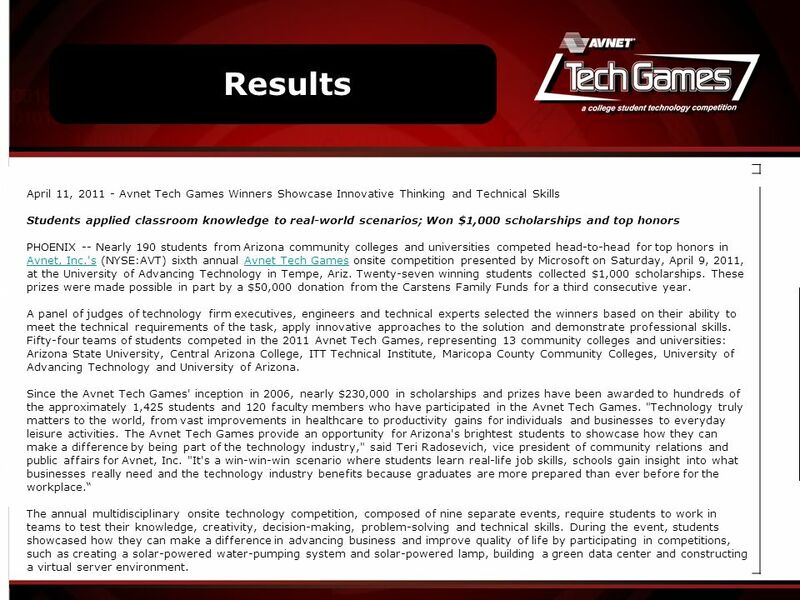 The Avnet Tech Games provide an opportunity for Arizona's brightest students to showcase how they can make a difference by being part of the technology industry," said Teri Radosevich, vice president of community relations and public affairs for Avnet, Inc. "It's a win- win-win scenario where students learn real-life job skills, schools gain insight into what businesses really need and the technology industry benefits because graduates are more prepared than ever before for the workplace. The annual multidisciplinary onsite technology competition, composed of nine separate events, require students to work in teams to test their knowledge, creativity, decision-making, problem- solving and technical skills. During the event, students showcased how they can make a difference in advancing business and improve quality of life by participating in competitions, such as creating a solar-powered water-pumping system and solar-powered lamp, building a green data center and constructing a virtual server environment. 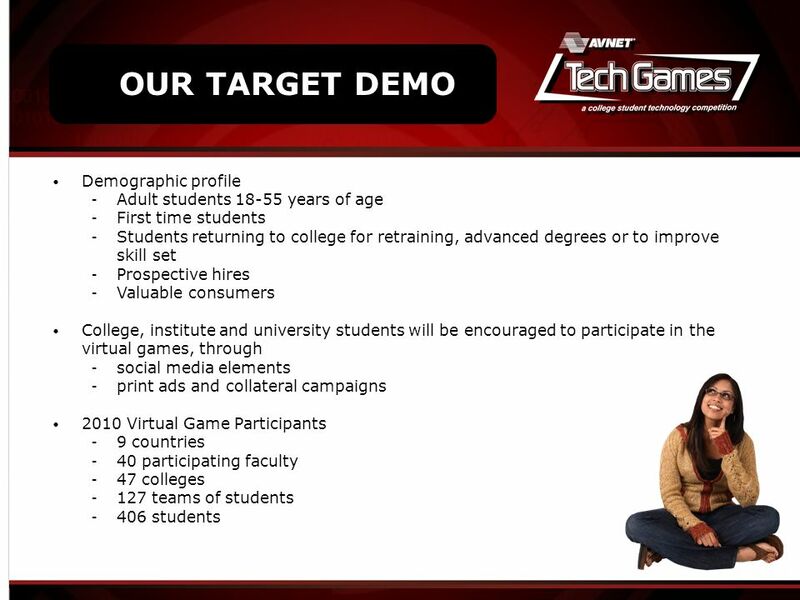 11 5/18/10 Virtual Games – Spring and Fall Results April 11, 2011 - Avnet Tech Games Winners Showcase Innovative Thinking and Technical Skills Students applied classroom knowledge to real-world scenarios; Won $1,000 scholarships and top honors PHOENIX -- Nearly 190 students from Arizona community colleges and universities competed head-to-head for top honors in Avnet, Inc.'s (NYSE:AVT) sixth annual Avnet Tech Games onsite competition presented by Microsoft on Saturday, April 9, 2011, at the University of Advancing Technology in Tempe, Ariz. Twenty-seven winning students collected $1,000 scholarships. These prizes were made possible in part by a $50,000 donation from the Carstens Family Funds for a third consecutive year. Avnet, Inc.'sAvnet Tech Games A panel of judges of technology firm executives, engineers and technical experts selected the winners based on their ability to meet the technical requirements of the task, apply innovative approaches to the solution and demonstrate professional skills. 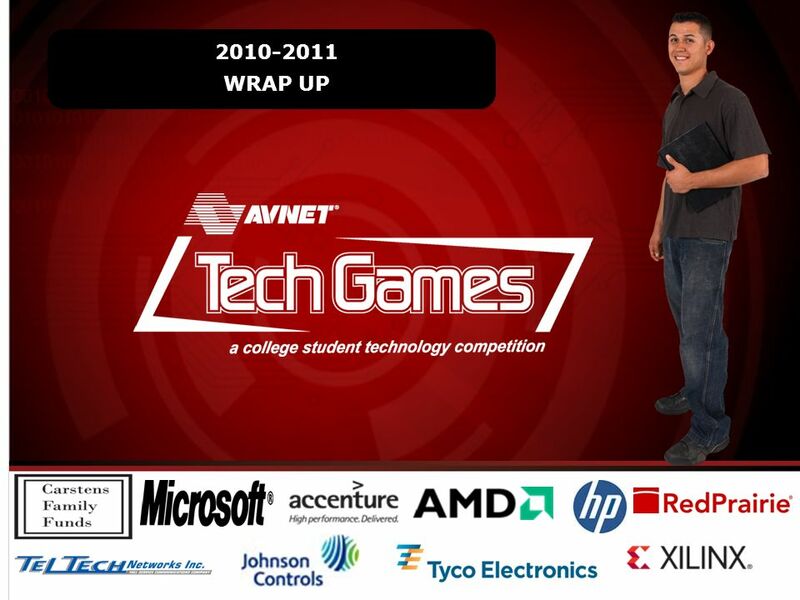 Fifty-four teams of students competed in the 2011 Avnet Tech Games, representing 13 community colleges and universities: Arizona State University, Central Arizona College, ITT Technical Institute, Maricopa County Community Colleges, University of Advancing Technology and University of Arizona. 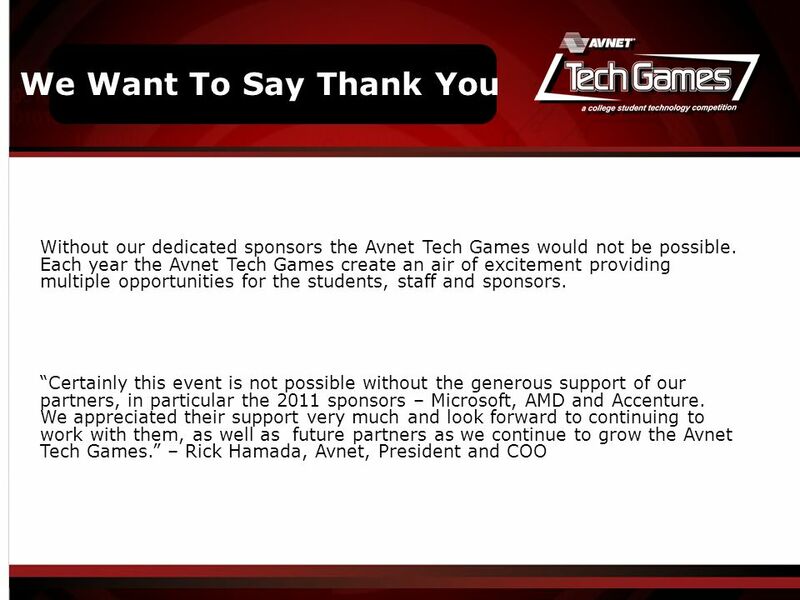 Since the Avnet Tech Games' inception in 2006, nearly $230,000 in scholarships and prizes have been awarded to hundreds of the approximately 1,425 students and 120 faculty members who have participated in the Avnet Tech Games. "Technology truly matters to the world, from vast improvements in healthcare to productivity gains for individuals and businesses to everyday leisure activities. 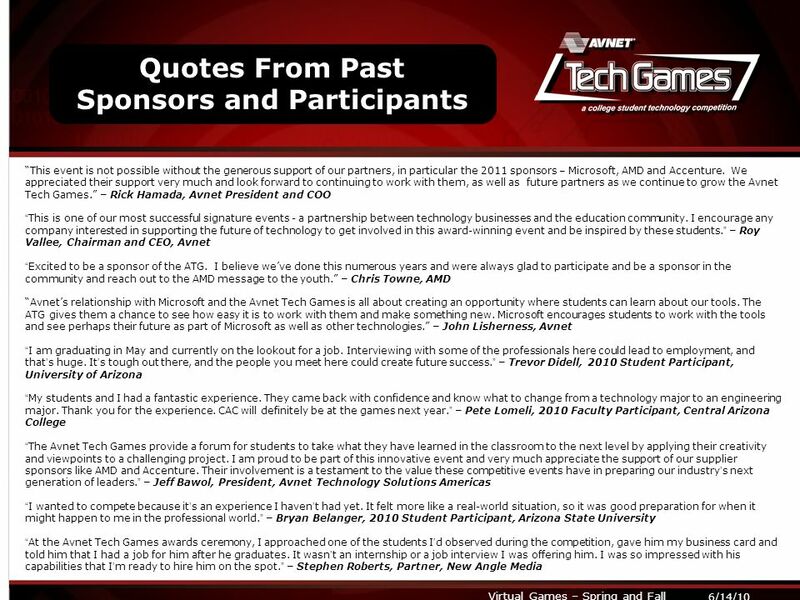 The Avnet Tech Games provide an opportunity for Arizona's brightest students to showcase how they can make a difference by being part of the technology industry," said Teri Radosevich, vice president of community relations and public affairs for Avnet, Inc. "It's a win-win-win scenario where students learn real-life job skills, schools gain insight into what businesses really need and the technology industry benefits because graduates are more prepared than ever before for the workplace. 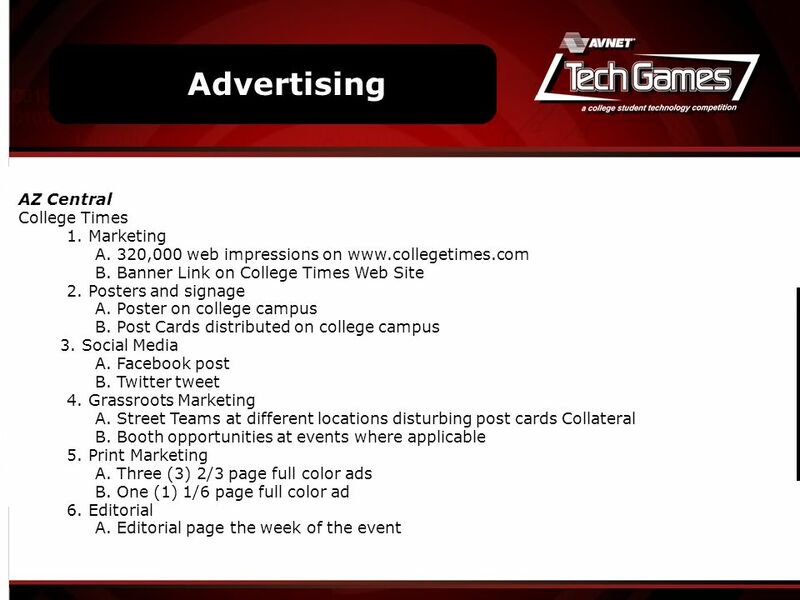 The annual multidisciplinary onsite technology competition, composed of nine separate events, require students to work in teams to test their knowledge, creativity, decision-making, problem-solving and technical skills. During the event, students showcased how they can make a difference in advancing business and improve quality of life by participating in competitions, such as creating a solar-powered water-pumping system and solar-powered lamp, building a green data center and constructing a virtual server environment. Download ppt "5/18/10 Virtual Games – Spring and Fall 2011 Sponsors: 2010-2011 WRAP UP." The Future of Communications in Higher Education Joseph Hice, APR, CPRC Chief Communications Officer Associate Vice Chancellor NC State University. Presented by: Matjaž Mikac, IM & FT Chess in School Slovenia. ENERGY ENGINEERING MASTERS DEGREE. Why a Consortium? Great problems are solved with high performance equipment. We celebrate that eight leader companies. The Role of Employer Advisory Committees: Moving to the Next Level Wisconsin Educational Approval Board Conference November 17, 2011 Jay Hollowell. Employer Mentoring at Edinburgh Napier University Claire Bee Towards a Confident Future. 40 Tips Leveraging the New APICS.org to the Benefit of Your Organization, Members, and Customers! 1. 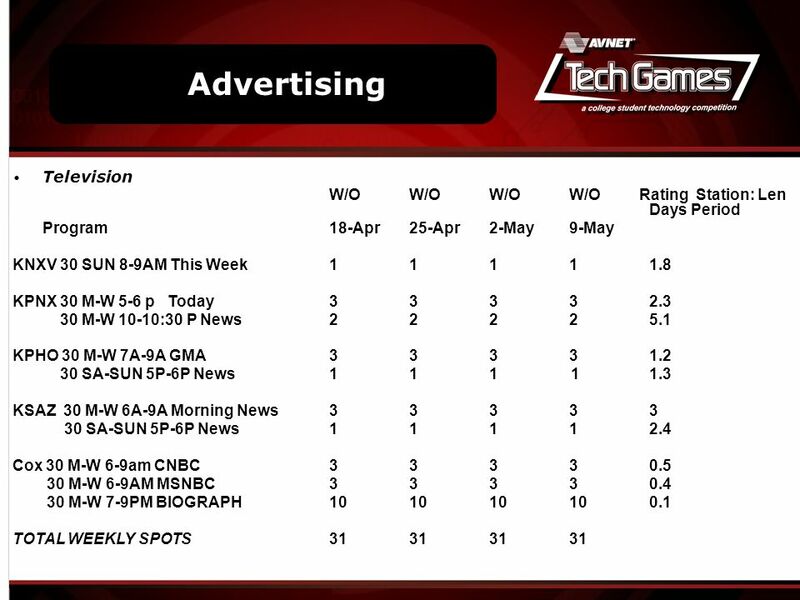 1 1 The Power of NBC 5 CHICAGO and NBC5.com! ZOOLIGHTS 2007 MARKETING PARTNERSHIP. BLACK HERITAGE SOCIETY Presents 36 th Annual Original MLK Parade & Holiday Weekend Celebration JANUARY 17, 18, 19, 20, 2014 *PARADE BEGINS DOWNTOWN HOUSTON. ATHENS AREA JUNIOR GOLF TOUR Sponsor Information. Big Brother Duck Shoot Viral. 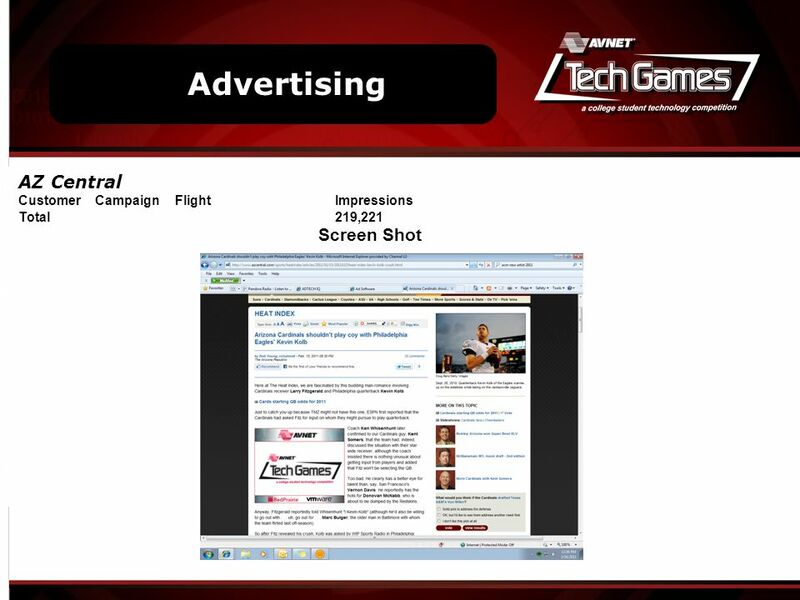 Company Information With over 12 years experience in the industry, T-Enterprise is the UK's leading flash games and software. National History Day. Why participate in Maryland History Day? Learning about history is fun! With Maryland History Day, history is much more than memorizing. COMPANY PROFILE:COMPANY PROFILE: Founded in 2002 Recently completed merger Diverse mix of clients Full-Service PR and marketing firm One of the fastest. Engineering and Technology Education FIRST ROBOTICS. FIRST: For Inspiration and Recognition of Science and Technology. The Ultimate Big Brother Quiz. Company Information With over 12 years experience in the industry, T-Enterprise is the UK's leading flash games and software.